A wide QRS complex is more than 2.5 mm (100 msec) at standard settings. This can be caused by ventricular rhythms / pacing or abnormal conduction e.g. 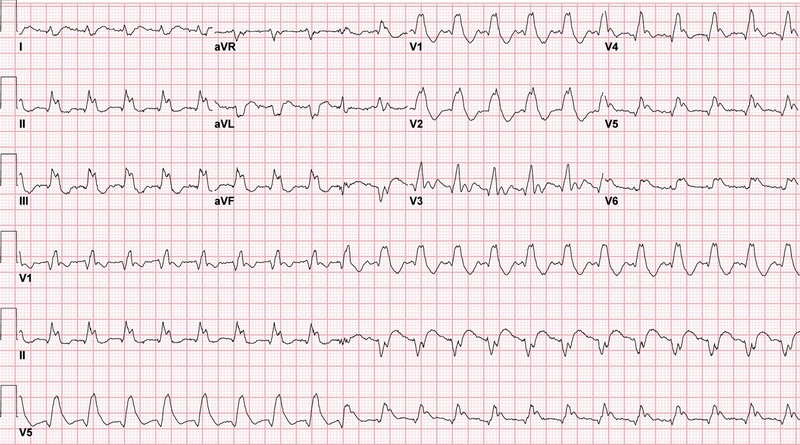 bundle branch blocks, hyperkalemia, sodium channel blockade, pre-excitation or hypothermia. The QRS must be more than 3 mm (120 msec) to diagnose a complete bundle branch block. This ECG is from a man in his 60s who presented following a dothiepin overdose. This ECG shows wide QRS with R in aVR and RBBB morphology, caused by sodium channel toxicity. This ECG is from a woman in her 60s who presented from a nursing home with altered mental status, hypotension, hypoxia and bradycardia. This was the repeat ECG after placement of a transvenous pacemaker. This ECG shows a very wide ventricular paced rhythm with widespread excessive discordant ST elevation. The cause was hyperkalemia.